Step 2 in a bowl. Refrigerate while you prepare the jalapeños. Step 3 Cut the jalapeños in half lengthwise and gently scoop out the flesh and seeds with a small spoon or pairing knife, being sure not to break the peppers. Step 4 Combine the bread crumbs with the paprika, garlic powder, and salt in a shallow dish. Step 5 Line a baking sheet with parchment paper. Step 6 Stuff the jalapeño halves with the cream cheese mixture. Have some of the mixture slightly piling out of the halves but not overflowing. Sprinkle the tops with the bread crumb mixture, coating them well. Place on the baking sheet. Step 7 To help brown the tops, spray with a light coating of oil. Bake for 18 to 20 minutes until golden brown. Step 8 Serve immediately with a drizzle of the aioli on each piece or serve the aioli on the side as a dip. Step 9 Combine all of the marinade ingredients together in a bowl or wide dish with a whisk or fork. Step 10 Soak the sundried tomatoes in warm water for 10 minutes and then drain. This helps to soften the tomatoes for blending. Step 11 Add the sundried tomatoes and remaining ingredients to a high-powered blender and blend until very smooth. Alternatively, use an immersion blender to combine all the ingredients in a tall jar or other container and blend until very smooth. 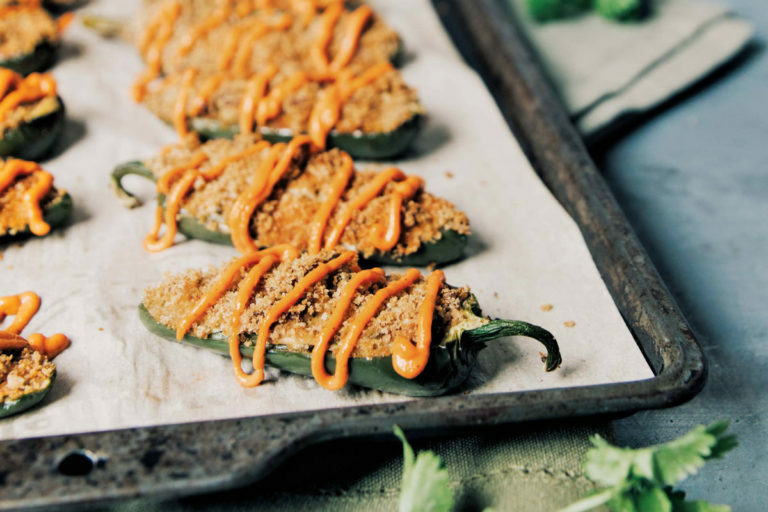 These baked jalapeño poppers are just a healthier version of your favourite app. A classic appie shouldn’t be messed with too much so I kept these poppers pretty true to what you’re used to, stuffing them with an herby cream cheese filling and bacon bits. They’re just the right size to eat in one or two bites with your hands. If you’re afraid of being eaten alive by the heat of a jalapeño, the key is cleaning out the middle seeds entirely, but as someone who walks on the mild side I find the cream cheese and The Sundried Tomato Aioli also helps soothe the heat while you eat!